usually a series of obstacle courses, and you had to get through the different obstacles to get to the next level. They were very fun because you had to use a combination of quick thinking, and team work with your fellow players. So anyways, I decided to make my own little Bound. The game and the source are included. It's basically a 3D FPS shoot-em-up type game. 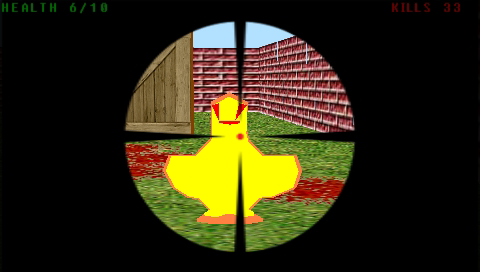 Shoot the ducks to survive. I started this back in late August, worked on it like crazy for a day, then I just forgot about it. Months later, insomniac released 48 hour pong(which was exactly what I was aiming for). Soooo, I've decided to finish my game finally. The game is exactly what it says it is. 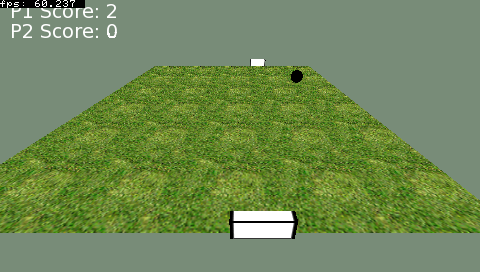 3D Pong. It was more of a learning experience than anything. I had fun developing it, so whatever. Just to keep things simple, don't get 'eaten' by any of the blue/green squares. - Use the analog stick/d-pad to maneuver around. - In 'story mode' use cross/circle/triangle/square to shoot.